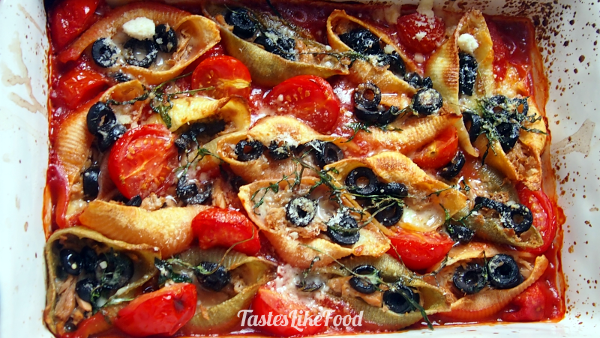 A nice bed of pasta shells filled with oven-melted mozzarella. The shells, crunchy on the surface and around the edges and very soft in the middle, are served with a warm tomato sauce and a combination of cherry tomatoes, olives, and Porto wine, just to give it that extra taste that makes it all much more interesting. 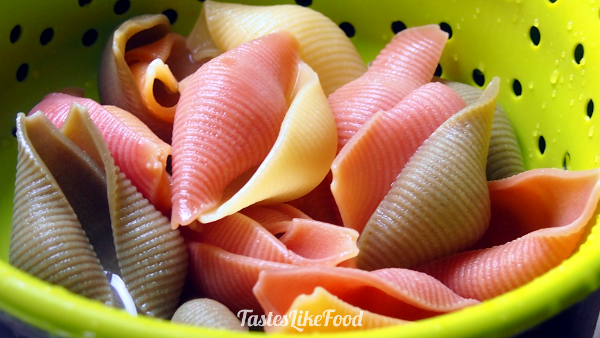 The idea of filled Conchiglie always brings a smile to my face. It tastes best with this tomato sauce. Cook the Sweet Tomato Sauce. Cook the pasta al dente (don't overboil it, as it will still boil in the tomato sauce while in the oven). Preheat the oven to 200°C. 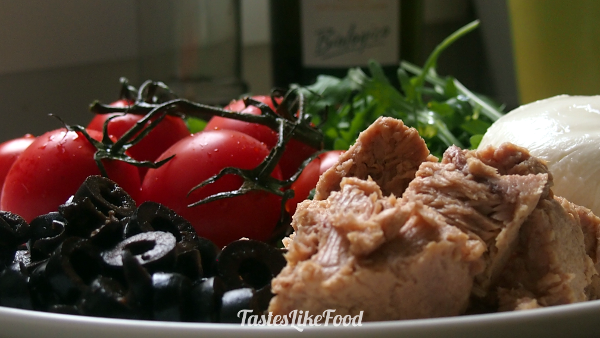 Drain tuna and shred it into small pieces. Do the same with mozarella. 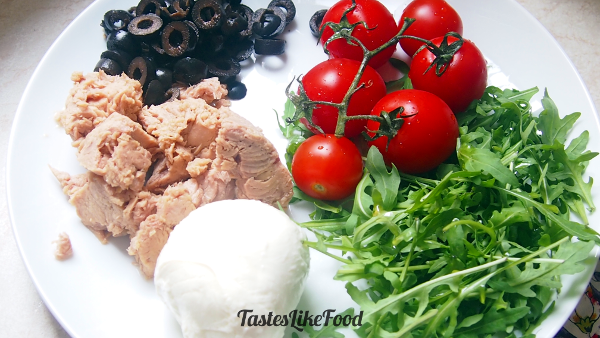 Slice black olives and halve tomatoes. 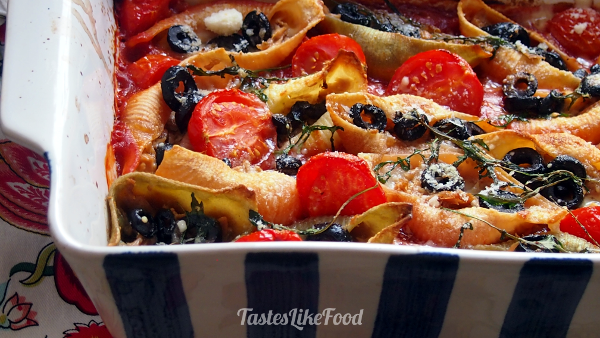 Pour the tomato sauce into a casserole. 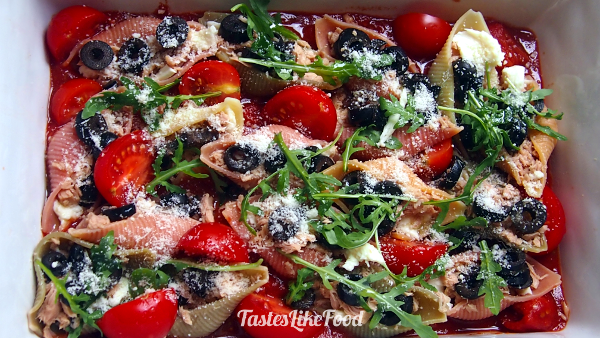 Fill cooked conchiglie with mozarella, tuna and olives and place on top of the tomato sauce. Season with freshly ground black pepper. Bake the conchiglie for 15 minutes. After that, turn the grill function on and bake the pasta for another 5 minutes. Take the conchiglie out of the oven and allow to rest for 5 minutes. Spread parmesan on top. Serve with fresh rucola.